FreeNYC.net has a longstanding reputation as the most recognizable personal project of Defined by Media. What began as a tiny blog instituted in 2005 has since grown into New York City’s most respected resource for free events and activities. Created during the blogosphere’s infancy, FreeNYC was built as a passing attempt to understand the blog and how it could be instituted in future sites. 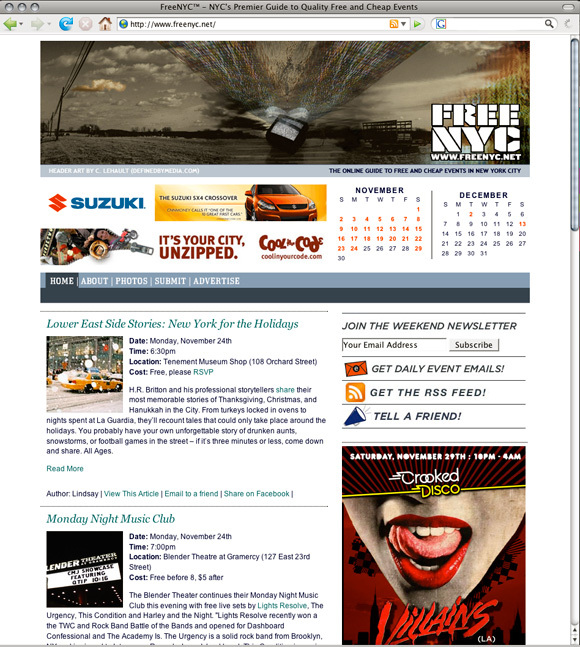 Some 8000 free event listings later, FreeNYC hosts a mailing list of 30,000+ New York's who rely on the daily listings. Additionally, FreeNYC has gone on to host and support events–- both by other parts as well as one's curated by Defined by Media–- to give back and liven up New York Nightlife. FreeNYC will undergo a full overhaul in both design and infrastructure during 2009 to bring more targeted events the the readers in a more effective manner. Design, develop, maintain, and curate FreeNYC.net, New York City’s leading site for free and inexpensive events. Easily maintained web presence to provide New Yorker's with a viable resource to cut living costs.